Kaladin was captured and trained to be part of Bridge 4 for Sadeas’ army. He eventually starts to lead the group because they all end up loving him. He gets left outside during a highstorm, which is when people start to realise he has some weird powers going on with him because no one should be able to survive that. Meanwhile, Dalinar, the king’s uncle, has been experiencing weird visions. People think he’s a bit crazy, but he pulls through and then after a betrayal from Sadeas, Kaladin saves his life. SHIP. Shallan has worked as a ward for a powerful woman, and steals her Soulcaster. However it tuns out that she doesn’t need a Soulcaster to Soulcast. Jasnah and Shallan team up and it’s revealed that Jasnah thinks there Parshmen are Voidbringers. The prelude is about the Heralds (leaders of the Knights Radiant), who have been fighting Voidbringers for thousands of years. Usually the Heralds are to die in battle, before being reborn and starting the cycle again. The Heralds decide they’ve had enough of this, and they abandon one of their own so the rest of them can gtfo. The Shardblades and Shardplates come from these guys. Skip forward a few thousand years, and we meet our main characters: Kaladin (swoon), Dalinar (SWOON), Shallan, and also Szeth and Hoid. Szeth is basically an assassin and is sent to murder the king of Alethkar. He is very reluctant to do this but he is forced to. It’s revealed that he has a Shardblade later on, and also has an ability called Surgebinding. The Parshendi take credit for this murder, which brings about the War of Reckoning between the Alethi and the Parshendi. We meet Dalinar, who is the brother of the murdered king. We find out that the king left a message before he died, telling Dalinar to use an ancient book called The Way of Kings. Kaladin, my precious, was trained as a surgeon before joining an army. He is caught and enslaved, and sent to work as a bridgeman for Bridge 4, part of Sadeas’ army in the War of Reckoning. Kaladin starts talking to a spren called Syl, who is adorable and I would totally ship it except… yeah. She’s lovely to him and she loves him because he’s honourable and kind. Dalinar starts to get visions in which he sees the Knights Radiant. Throughout the book, they start to reveal things about the Voidbringers, amongst over things. Shallan has been sent to work for Jasnah (Dalinar’s niece) in order to secure a Soulcaster so she can switch her own broken one with it. Kaladin takes control of Bridge 4 (because they love him) and he makes them use their bridge as a shield in battle. He gets beaten, and is left outside overnight during a Highstorm, which should really have killed him but for some reason he survived. Kaladin seems to have the power to drain Stormlight from spheres. Dalinar’s nephew, the new Alethi king, starts to become paranoid that someone wants to take his life. Dalinar tries to deal with him but struggles. Dalinar doesn’t really want to fight thanks to the visions, and his son, Adolin, thinks he’s a bit weird for suddenly changing his mind because, hello, they are at war. Shallan ends up using the Soulcaster, turning a goblet into blood. Gross. People think she has tried to kill herself. It’s revealed that Kaladin joined the army when he was younger, along with his brother in a true Katniss/Prim moment. Unfortunately, he’s unable to protect his brother, or anyone else in his crew, and this really gets to him. Understandable. Dalinar hears the voice again telling him to “unite them”. He sees an old guy who tells him stuff about the Knights Radiant standing again, and the man claims to be God. Sadeas betrays Dalinar when they’re out fighting the Parshendi, and basically leaves him and his crew to die. Kaladin realises what’s going on and goes to save Dalinar, and a ship is born. Shallan discovers that Jasnah’s Soulcaster is fake, meaning Jasnah and Shallan can both Soulcast without a Soulcaster. Jasnah reveals her research about the Knights Radiant and the Voidbringers, and the pair get ready to travel to the Shattered Plains to meet with Dalinar. Stormlight: Energy given off by high storms. Can be stored in gem stones and apparently used by Kaladin. 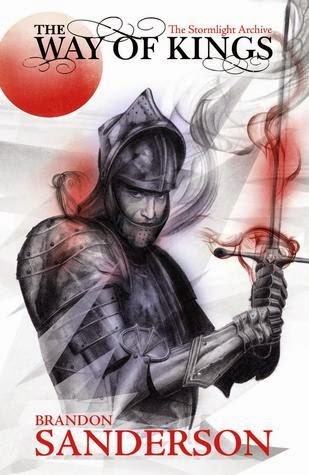 Shardbearers: People who possess Shardblades. Honorblades: An epic form of Shardblade. Shardplates: A magically-enhanced plate of armour. Recharged by Stormlight. Surgebinding: The ability to control gravity. Soulcaster: An object that allows people to transform things into other things.